Chronic Renal Disease comprehensively investigates the physiology, pathophysiology, treatment, and management of chronic kidney disease (CKD). This translational reference takes an in-depth look at CKD while excluding coverage of dialysis or transplantation, which are both well detailed in other textbooks and references. Chapters in the basic science sections are devoted to the scientific underpinnings of the development and progression of CKD, including consideration of different etiologic factors. Chapters in the treatment and management sections are geared towards the most common problems faced by nephrologists in the management of CKD. Each chapter relates specific illnesses to the CKD framework instead of covering only the specific illness. Readers will learn, for example, how the management of CKD in a patient with diabetic nephropathy differs from that of other CKD patients. Chapters indicate which unique complications the reader needs to be aware of when treating a specific patient or disease. 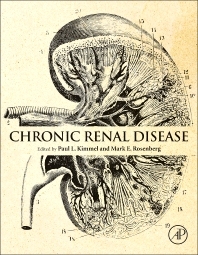 Chronic Renal Disease includes a companion web-based question and answer supplement to each chapter. This is a valuable resource to reinforce the content of the chapters. The questions are multiple-choice, clinically focused and include referenced discussions of answers. The questions can be used for medical student, resident and fellow teaching, preparation for board or maintenance of certification examinations, and clinician teaching or conference preparation. Is Albuminuria an Independent Target? Why Should Patients With CKD Stages 3–5 Be Treated With a Statin? Why Not Perform Frequent Follow-Up Measurements of Serum Lipids? Chapter 70. Chronic Kidney Disease in the Elderly – Who Has it? Who Does One Treat and How are They to be Treated?